If forging a new unified vision is the key to moving forward, then breaking away from the status quo in eLearning becomes the tipping point. It is a tipping point because the forces wanting to maintain the status quo have been entrenched in education systems and learning cultures of business organizations for so long that their influence stretches back through all levels of the education systems from which our future employees and business leaders will come. If you think about the mindset and attitudes prevalent in all levels of education, maintaining sets of learners at all levels meant that conformity and obedience to the status quo were the "marching orders" of the day. Learners who demonstrated skills and talents that were above and beyond the status quo were "off-ramped" from those making up the status quo to be with their own kind. Star Trek's nefarious villains, "the Borg," said it best when it comes to the state of education systems. “ We will add your biological and technological distinctiveness to our own. Your culture will adapt to service use. Resistance is futile”. It is rare to hear the words of an organization stating: "We are looking for individuals who are extraordinarily talented". Instead, it is more like:"let's fish from the pool of the status quo in the hope that we can match someone up with what we are looking for". As we advance into the age of exponential information and learning, we need to stop settling for the status quo which filters up from the education systems in the form of prospective employees, and especially, prospective leaders. 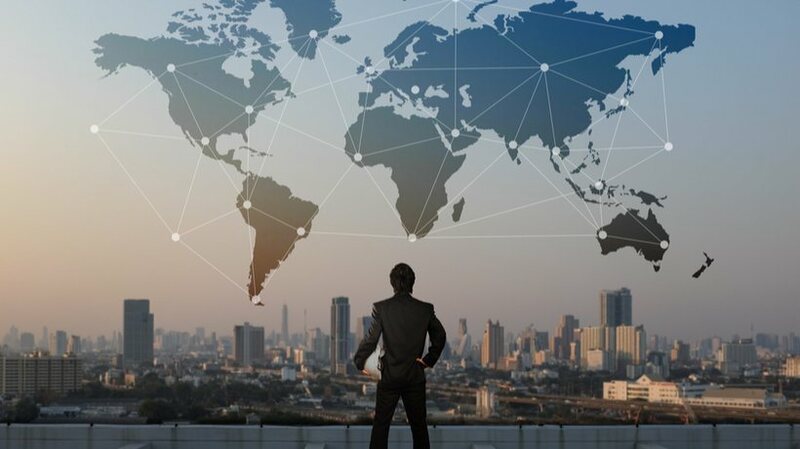 "Talent acquisition in a global digital economy is a 'blood sport'. As a business organization that wants to compete globally, it is important that you set goals that aspire to seek out individuals who are not only extraordinarily talented but are also in sync with an age of advancing technology and information creation". The authors state: " We will provide learners sufficient levels of realistic practice; for example, simulations, scenario-based decision making, case-based evaluation, and authentic exercises". The authors state: "We will provide learners with sufficient experiences in making decisions in authentic contexts". The authors state: "We will provide learning with guidance and feedback to correct their misconceptions, reinforce their comprehension, and build effective performance skills". The authors state: "When providing performance feedback during learning, we will provide learners with a sense of the real-world consequences". Creating irresistibly engaging learning experiences for employees means that they are full participants in their learning instead of just a "passive audience" viewing a Powerpoint presentation and they are afforded, if time permits, questions at the end. The experiences must be meaningful and represent realistic representations of the real world that they experience within the business organization. They must be able to make decisions and receive realistic immediate feedback where they can see the consequences of the decisions they have made. The use of simulations, scenarios, and case studies highlight the importance of collaborative, experiential learning in building deeper learning leading to higher performance. In order to achieve what principles 4-7 suggest, we need to examine how we design instructional experiences using technology and applications that will engage employees in their learning. 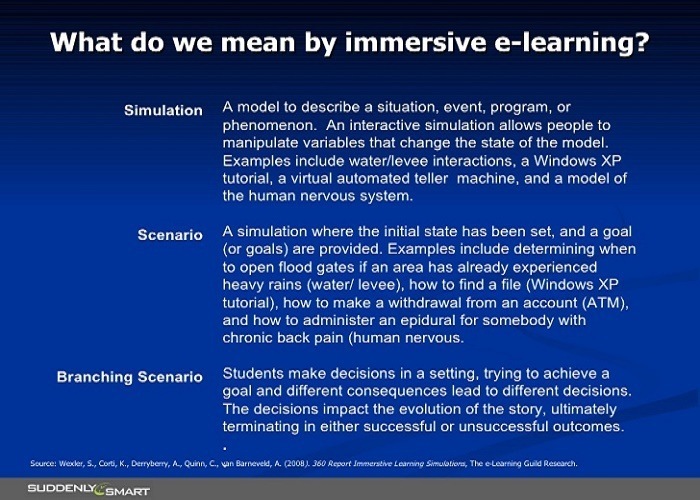 The use of simulations as a way to engage learners in realistic situations where the decisions they make result in immediate feedback and consequences in regards to how the simulation unfolds is not a new technique. Simulations have been used by NASA in training astronauts on everything from piloting the space shuttle to dealing with emergencies in the international space station. Simulations in the 21st century make use of the more recent useful technologies such as augmented technology, as well as holography. These technological simulations have shown great potential in the field of medicine and engineering. They allow employees to make mistakes and learn from them without serious repercussions. Feedback is immediate within the context of decision making. They support a team approach to solving problems and an opportunity to see how they would adapt to unforeseen events entering the simulation. They allow employees to improve and refine their skill sets which in turn translates into improved performance in their area of expertise. In October 2016, I published an article on LinkedIn titled: "The Time Traveler's Journey: Re-Living Historical Events Through Immersive Scenarios". This article was to be the first part of a 2-part article that explored how we could get learners to examine decisions made by leaders during world historical events by immersing them in the actual scenarios. It is now 2018 and the reason part 2 was not forthcoming was that the tools used to create interactive scenarios, in which learners have an active part, were changing. "What exactly do we mean by "immersive"? In the 21st century, the learning culture of a business needs to be transformed from the design that meets business needs to that design which meets the learning needs of those who are the stakeholders of the business (from the CEO/CLO at the top to those who labor at the entry levels of the organization). Specifically, a "technology sandbox" is an online area hosted by the business organization within their network, where employees can go to try out new applications and technologies that will enable them to grow their skillsets as they apply to their area of expertise. For example, for an engineering sector within the organization, the organization could offer a collaborative area where engineers could meet to solve problems by manipulating 3D objects in simulation mode. In this instance, they could see how their changes affect systems as a whole or in part. It would be available 24/7 to all stakeholders. It would be accessible from any device from a smartphone to a tablet. With the advancement of HTML 5.0, the area would be automatically scaled to fit whatever device being used. It would allow for collaboration regardless of what region of the world the area is being accessed from. It would be encouraged as part of the informal learning that contributes to any formal learning that is prescribed. If we want employees to be truly engaged in advancing their learning, which leads to better performance, we need to be able to identify what engages networked learners of the 21st century. A number of new trends in learning, which have been brought on by the technology and information revolution, have appeared. With a far more mobile workforce, microlearning has risen to the spotlight where being able to access small amounts of information quickly and from any device at any time is growing in popularity as opposed to formal courses. This trend coupled with the rise of informal learning gives us a snapshot of how on-the-go individuals adapt technology to their needs. Another interesting learning principle focuses on an idea from our childhood when as children, our favorite time of the day was "tell me a story" time. As we became adults, becoming engaged in a story might mean reading an engrossing novel or watching a movie. This learning principle, that people are more willing to learn something if it is presented in a format where a story is told and they identify with the characters to the point that they feel being part of a story, has reached the 21st century in the form of serious gamification. One idea that is common to all requirements is that they reflect a "mentor on the side" approach instead of the "sage on the stage" approach. This means that the traditional approach represented by the "sage on the stage", which has been at the heart of training for decades, is no longer an effective approach to engaging employees in their upgrading of skillsets and learning in general. "What design tools can meet the requirements for creating a needed transformation in the learning culture as outlined?" In part 3 of this article, we will look at some of the pros and cons of some of the above, and will also suggest some more unorthodox tools that involve the use of serious gamification elements to create the irresistibly engaging immersive learning environments.